Safety First: Facility Logistic Services Leads The Charge - Facility Logistic Services, Inc. Facility Logistic Services leads safety seminar in Neenah, WI. Facility Logistic Services continues to lead the safety charge. FLS Warehouse lead in Neenah, WI, Kristen Rusch recently led weekly safety training for our customers, contractors and FLS employees in one of our customer’s facilities. This is another phenomenal example of Facility Logistic Services’ commitment to safety first, and the value that our associates bring to our customers. Great job Kristen! Always be vigilant about workplace safety. Safety first. Produce quality work held to the highest standards. Increase efficiency through smart personnel, operating and accounting practices. 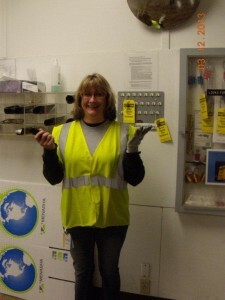 Want to learn more about how we place safety first in your facility? Contact us. This entry was posted in Blog and tagged 3rd party logistics, facility logistic services, insourcing, manufacturing, neenah WI, north carolina warehouse, safety, supply chain, warehouse staffing, workplace safety standards. Bookmark the permalink.